6, 8, 10, 12+ foot tables. We can deliver. High quality suitable for private or commercial use. 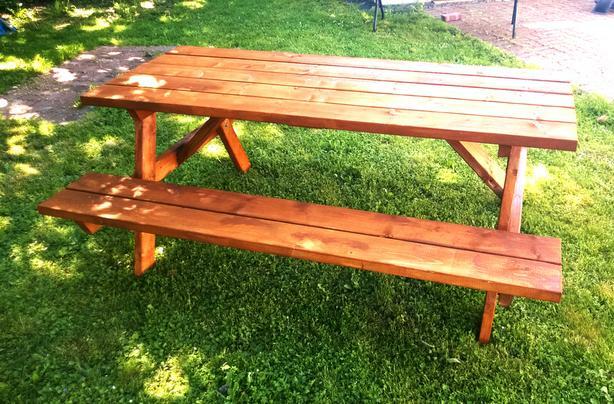 Handmade from island-milled, Grade-A sustainable lumber, fine-sanded edges, cedar-stained traditional picnic tables. Conditioned & treated before assembly for weather and bug resistance, our tables are sturdy and built to last with pride by husband & wife team. Our standard table benches are two-piece for superior comfort. We hand-pick wood with character and use chrome plated hardware as well as plastic-coated screws to prevent rusting in our salty climate. Why spend hundreds on cheap box-store outdoor furniture that can't hold up to our salty climate when an attractive, locally sourced, hand-built table costs less? Approximate Dimensions: Our tables have a 16.5 - 17" bench height and 30" top height. Our standard table top is approximately 29" wide, 56" wide over all. Extra-wide tops are 39"-40", 67" wide over all. Commercial/High Use Options (Added structure, Triple Varathane, Stainless Hardware, etc): Please Inquire. Do you have a request or idea? Let us know! Free pickup. Please add $10 for delivery of a second table to the same location. We deliver complete tables up to 10 feet and build, dissemble, then reassemble our extra-wide or longer tables on site. Reassembly takes 20 minutes. * Some orders/deliveries require a deposit. We're located near Costco and accept cash or e-transfers for deposits. Cash payment due upon delivery. We're proud to support local Island mills and other businesses. Thank you!